Trouble has descended on another of the individuals pardoned by former President Clinton, but this time, the problem's a little closer to home. Police in Hermosa Beach Sunday afternoon revealed that Mr. Clinton's 44-year-old half-brother, Roger, was arrested Saturday on suspicion of driving while intoxicated. Hermosa Beach Police Officer Paul Wolcott says Clinton, 44, was arrested early Saturday after an officer spotted him driving erratically through this oceanside town 18 miles south of Los Angeles. Michael Ambrosini of CBS Station KNX-AM reports Clinton was pulled over by an officer who says he decided to investigate after seeing Clinton's Ford Expedition SUV run a stop sign and brush against the curb. Police say Clinton also exceeded the limit at another stop sign and at one point, straddled the center dividing line of the road. After several blocks, the officer stopped Clinton at 2:26 a.m. and reported that he smelled alcohol on Clinton's breath. Police say Clinton failed a balance and coordination test and was taken to the city jail for a breath test. Police have not released the exact results of the blood-alcohol level test. "There was no resistance," said Wolcott. "He only indicated that he had been drinking at one of the bars." An unidentified male passenger in Clinton's car was not arrested. Clinton, who lives in nearby Torrance, was released Saturday morning on his own recognizance. He was not required to post bail. He is scheduled to be arraigned in Los Angeles County Superior Court on April 2. 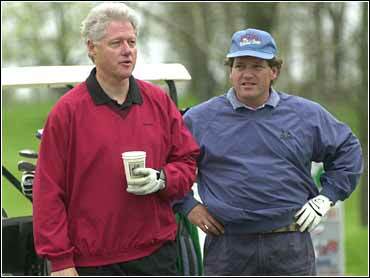 Roger Clinton is no stranger to legal troubles. He served more than a year in prison after pleading guilty in 1985 to a charge of conspiracy to distribute a single gram of cocaine. President Clinton pardoned him Jan. 20. The former president later described the drug prosecution as "the best thing that ever happened" to his brother. In 1998, a jury ordered Roger Clinton to pay a then-neighbor in Redondo Beach $1,258.10 for medical bills, one week's lost wages and unspecified damages after his dog attacked the other man's dog. In his 1995 book, Growing Up Clinton, Roger Clinton recounted his troubled life, including the physical abuse that he, his brother and late mother suffered at the hands of their alcoholic father, as well as his own addictions to liquor and cocaine.